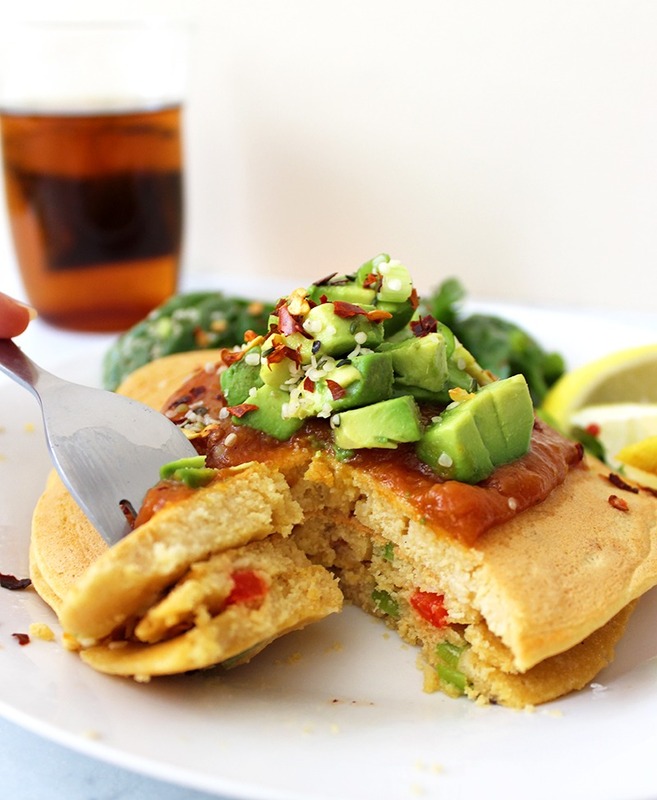 This savoury chickpea pancake recipe is a delicious & healthy alternative to an omelette. It’s dairy free & egg-free, as well as loaded with protein, iron & healthy fats! It’s soft, tasty and super easy to prepare! It took me quite a few times to get this recipe to a point that I’m happy with but it was well worth it. 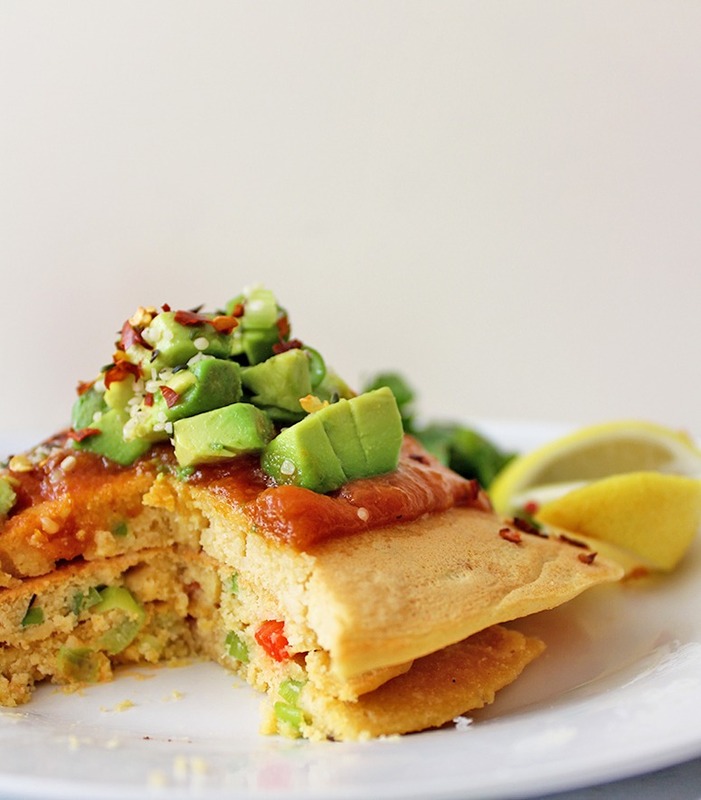 These savoury pancakes are soft, moist, incredibly tasty AND healthy. They’re flavoured with ground ginger, a pinch of salt and fresh spring onion and capsicum. I decided to serve them up with a side of spinach and topped with tomato relish, hemp seeds and chopped avocado, giving this dish plenty of protein, iron and healthy fats. 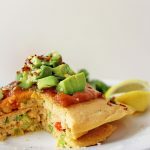 As someone who is very much a savoury-breakfast type of person, this recipe is for sure going to be made often in our house. 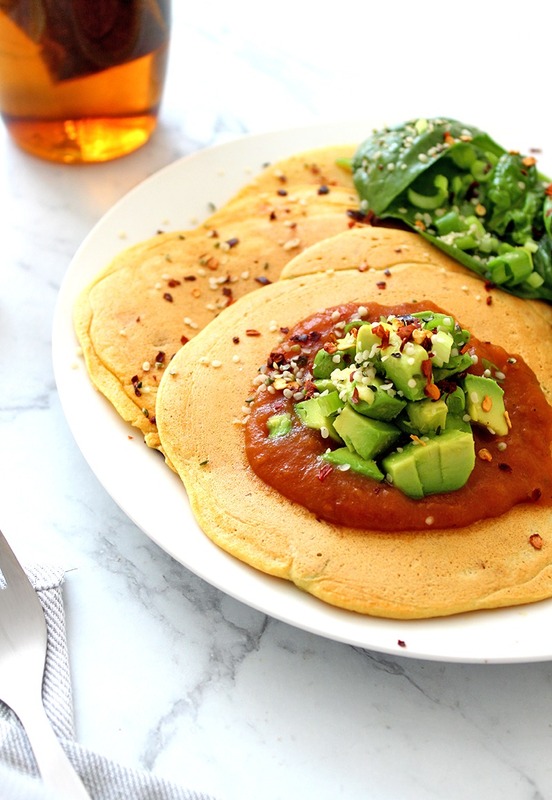 Chickpea savoury pancakes are a traditional Italian dish called Socca and are usually fire-roasted and eaten as a flatbread. It’s made with a base of ground dry chickpeas called chickpea flour, which can also be called gram flour, besan flour or garbanzo flour. If you can’t find chickpea flour at your local grocery store, try a health food store and failing that, search online for one that can be shipped to you. If you’re looking for more savoury brunch recipes, check out this Cashew Cream “Cheese” recipe to have on toasted bagels! At least 3 hours in advance, whisk together the chickpea flour, ginger and baking powder in a mixing bowl. Add the water and whisk again until it becomes light and fluffy like a whisked egg. Cover and place in the fridge for at least 3 hours or overnight. When you’re ready to cook your pancakes, chop the fresh spring onion and capsicum roughly into 1cm squares and mix into the chickpea batter. Add a pinch of salt to taste. Heat the oil in a frying pan over medium heat and pour 1/3 of the batter into the center. It’ll slowly start to form small bubbles and when the middle ones start to pop, you can carefully flip the pancake and let the other side cook for 1-2 minutes. 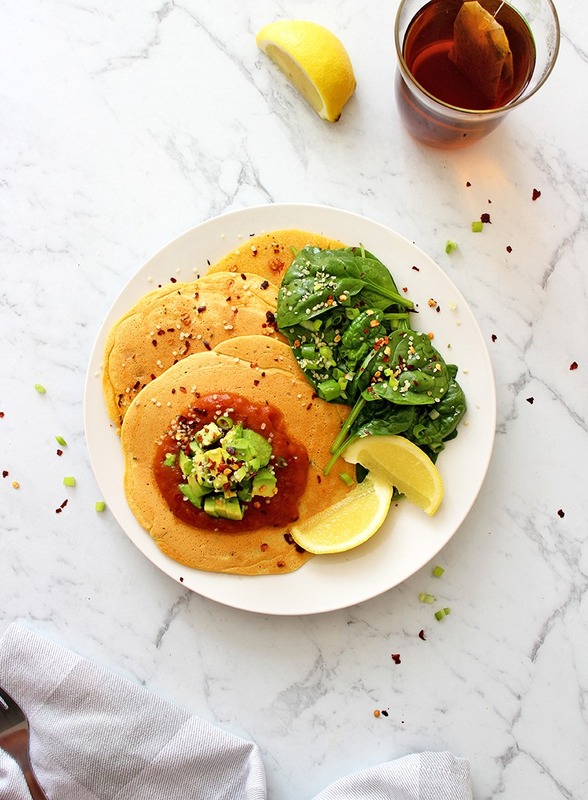 Serve your fresh savoury pancakes with the sides and toppings of your choice and enjoy!